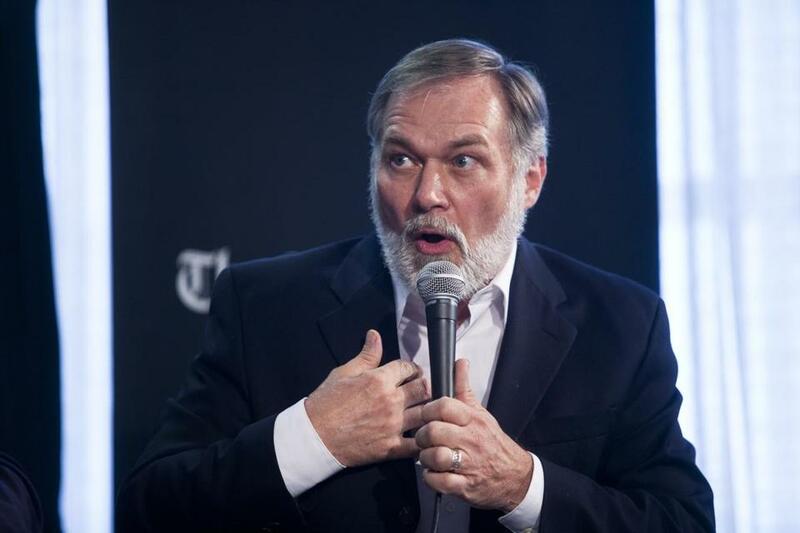 A top Republican does not want the party to support gubernatorial candidate Scott Lively (above), who does not support gay rights. Unleashing a scorching attack on the crusading antigay GOP gubernatorial candidate Scott Lively, a senior state Republican leader is calling on his party to scrap rules banning it from taking sides in primary fights and urging it to put its full organizational muscle behind Governor Charlie Baker’s reelection. House minority leader Bradley H. Jones has asked the state party’s top leadership to vote on his resolution that would specifically bar the organization from helping Lively, citing the challenger’s highly inflammatory anti-LGBT activities, according to a copy of Jones’s e-mail obtained by the Globe. A conference call to take up the resolution among members of the party’s executive committee is scheduled for Tuesday evening. But GOP insiders say the measure is expected to win approval. In his e-mail to the committee last week, Jones, who sits on the panel, argued the GOP’s credibility is on the line and called on his colleagues to resist Lively’s demands for equal support. Lively, a conservative Springfield minister, attacked the state party last week over its help for Baker after the Globe reported that the state GOP is driving the signature gathering for the governor and his running mate, Lieutenant Governor Karyn Polito. In a letter to the party, Lively demanded the GOP either pay a firm to gather 10,000 certified nomination signatures for him, or waive the $25,000 state convention fee, money he says he can use to pay professional signature gatherers. But Jones said the party’s bowing to Lively’s demands would damage its credibility. Jones did not respond to calls made to his North Reading home. The Massachusetts GOP has not repealed the rule in recent state political history. But scrapping it could solve its current political problem, which party officials created by exclusively using their staff to organize petition drives around the state for Baker and Polito. If the resolution is adopted, it would also be a clear demonstration of Baker’s tight control of the party and his ability to use its resources to raise money and finance his political activities. Since becoming governor, Baker has edged out any major opposition in the party, including the social conservatives who strongly oppose his more liberal positions on gay rights and abortion rights. But, it also could provoke legal challenges from Lively, who said Jones’s e-mail confirms his claims the party has broken its rules. Lively also said Jones is “confused” over what he is demanding. “I’m not demanding an endorsement from the party but an apology and compensation for damages to my campaign caused by their egregious ongoing violation of their own neutrality rules,’’ he said when asked to respond the House GOP leader. “His call for a vote by the executive committee to rescind the neutrality policy is not only too late to avoid harming me, it significantly bolsters my legal position by admitting in writing that the party is presently in breach,’’ he said. “As for his defamatory rhetoric, I would counter that under long-standing Republican principles, and the plain language of the national and state Republican platforms, it is Mr. Baker’s open and notorious support for the killing of unborn babies in the womb that is ‘violent’ and ‘toxic’ and ‘extreme,’ not my scholarship on well-documented LGBT history, which I would be pleased to debate him or his designee in any neutral public forum,” he said in an e-mail to the Globe. Still, Jones told his leadership colleagues that he supports giving Lively the opportunity to compete at the April endorsement convention, where any candidate seeking to get on the GOP primary ballot must get 15 percent of the delegate votes. “While it is important for us to ensure that our upcoming state convention is accessible, fair, and transparent for all delegates and candidates, it is equally important for our Party to clearly, unequivocally, and immediately reject any association with Mr. Lively’s views,’’ Jones said. “But we should not wait until the State Convention to make a strong statement against Mr. Lively’s detestable record,’’ he added.